Advantages: ETCs have always been useful to the solar water heating industry for their insulating design. The thin vacuum layer between two concentric cylinders of glass allows sunlight to stream through to the inner layer, but it prevents the resulting heat from escaping to the surrounding atmosphere. Disadvantages: The heat is stored in a fluid trapped inside the tubes (usually a water-glycol mixture) and transferred through a heat pipe to fluid flowing through adjacent plumbing. This plumbing is part of a closed loop of water-glycol circulated by a pump between the ETC and a heat exchanger attached to yet another source of water. Advantages: ICS systems, commonly known as batch heaters or batch collectors, are simple products to install, operate, and maintain. Potable water enters a tank contained inside an insulated box with a glass panel facing the sun. The box helps concentrate heat around the tank. After the water warms up, it flows directly through the pipes to its desired destination. Disadvantages: The interior of the box is not a vacuum, so heat does escape fairly easily. An ICS system will lose most of its gains overnight, even in moderate climates. GLE Solar combines the strengths of these two systems in a line of Evacuated Tube Batch Collectors (ETBC). Our units consist of a series of batch collector tanks housed beneath large evacuated tubes. Safe, clean tap water flows into our collectors to absorb heat from the sun. 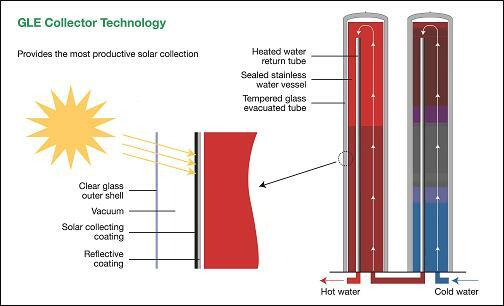 Sunlight passes through the three layers of the tube (glass, vacuum, glass) to warm the stainless steel tank beneath, and the heat is unable to escape beyond the interior glass layer. Afterwards, safe, clean tap water flows from our collectors to the intended point of use. DON’T warm the water during the day and then lose all of that progress overnight. DON’T require additional pumps to operate a simple installation. DON’T waste energy on one or two unnecessary heat exchanges. DO combine convenience and efficiency like nothing else on the market.